From the big band music of the early 1950’s through doo wap in the middle of the decade into the rockability of the late 50s the mood was optimistic. The music was fast and the beat was swing baby swing. Crooners like Sinatra, Como and Patti Page slowly gave way to artists like Little Richard, Jerry Lee Lewis and Bill Haley. Teenagers weren’t “the kids” anymore. They had spare money and lots of energy so they bought records and danced. What they listened and danced to was rock & roll …. Rock & Roll in fact never did die but from its roots in the 1950s it blossomed and grew into a music form that Bill Haley wouldn’t recognize. Electric replaced acoustic and studio over dubbing gave artists freedoms they never had before. Songwriters told stories. Genres were being created faster than charts could be made to track them. 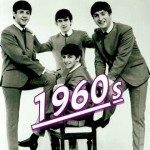 The British invasion added new names and new sounds to music. Elvis was still King and the Beatles ruled but there was plenty of room left for a whole lot of good music ….